1 Message LED (Yellow) Indicates the message number selected by number of blinks. 2 Memory OK LED (Green) LED is ON if valid message is detected. Blinks if no files are detected by system. 3 Select Push Button Allows users to select the current message position to record info. or play from. 4 Start/Stop Push Button Starts or stops recording or playback based on current mode of system. 5 Record Push Button Activates record set up mode. 6 Line In Level Knob Adjusts the audio level of the line input. 7 Mic In Level Knob Adjusts the audio level of the microphone input. 8 Power Jack Insert power adapter (Sold separately). 9 Mic Input (1/8" Mini Jack) Connect low impedance microphone for local recording. 10 Line Input (RCA Jack) Connect line level audio input for local recording. 11 Line Output (RCA Jack) Audio output level of up to +3dB into 600 Ὠ. This is standard level for most applications. 12 Speaker Output Audio output level of up to 2.5W into 8Ohm. Use this if more drive is needed. 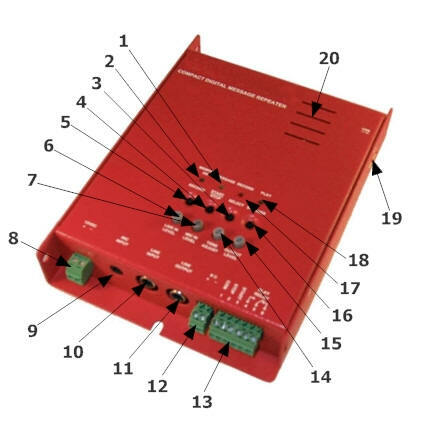 13 Remote I/O (6 pin) Provides remote access to start and stop control and play relay output. 14 Tone Adjust Knob Adjusts the Bass & Treble amount to deliver the best overall system performance. 15 Output Level Knob Adjusts the volume to both line level and speaker audio outputs. 16 Speaker Push Button Turns local monitor speaker On/Off. 17 Record LED (Red) Displays recording mode. Red light on indicates message is being copied. 18 Playing LED (Green) Green light is On when system is playing pre-recorded message. 19 USB Connector Audio files can be copied directly from a USB memory key to the systems internal memory. 20 Monitor Speaker Allows user to preview message play back.